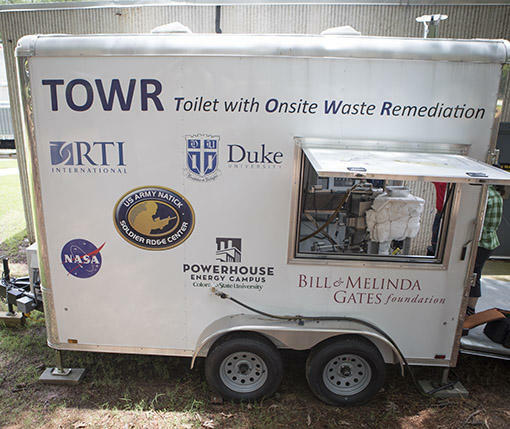 The TOWR Mobil Unit is currently used for testing and housed at RTI International’s facility in RTP. North Carolina-based RTI International is developing something that could reduce the number of troops injured while supporting forward operating bases: a new latrine system. Over 60 percent of U.S. troops injured in Iraq and Afghanistan occurred among personnel supporting bases in combat zones. Senior Research Scientist Jeff Piascik said RTI's revolutionary military toilet would reduce the number of troops needed to transport water and fuel used for current latrines. Called TOWR, for Toilet with On-site Waste Remediation, the new self-contained system treats liquid waste so it can be re-used for flushing and for non-potable purposes such as cleaning vehicles. The solid waste is captured and reduced to ash in a process that creates thermal energy--a potential power source. "And now all of a sudden we have a system that not only provides electricity to run it, it also could potentially provide electricity for other applications outside of it and then we also have a waterless toilet," Piascik said. And the system could be used beyond military bases, Piascik added. "In refugee camps," he said, "when you look at the latest natural disasters we've had here in the United States, down in Houston and Florida." The TOWR system is still two to three years away from being used in the field.